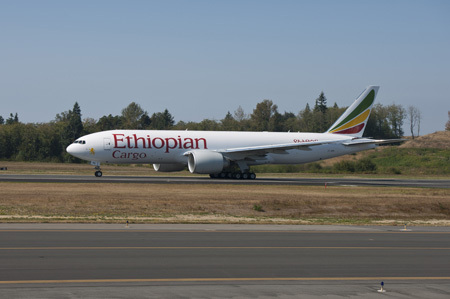 Air101: Ethiopian Airlines orders two 777 cargo planes. Ethiopian Airlines orders two 777 cargo planes. 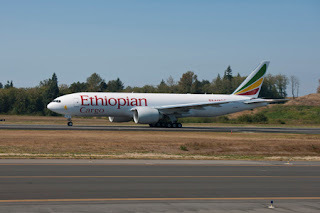 Ethiopian Airlines announced an order for two Boeing 777 Freighters – the world's largest and longest-range twin-engine cargo jet – in a deal valued at more than $1.3 billion at list prices' although the actual price is said to be half that amount. The deal was announced at the Dubai Air Show and is a new order for two freighters. The airline also confirmed the order for two aircraft it had previously announced 'commitments' for in June. "This aeroplane order will provide Ethiopian's Cargo & Logistics business with enhanced cargo capacity and better operating economics as we continue to build one of the largest cargo terminals in the world," said Tewolde GebreMariam, Group CEO of Ethiopian Airlines, who signed for the new aeroplanes at the 2017 Dubai Airshow. "Operating high-performance aeroplanes such as the 777 Freighter is a reflection of our commitment to expand and support the growing imports and exports of our country and the African continent." With nearly 100 aeroplanes in operation, Ethiopian flies one of the largest and youngest fleets in Africa, including Boeing 737s, 757s, 767s, 777s, and 787s. "We are honoured that Ethiopian Airlines, one of Africa's leading carriers, has again selected Boeing aeroplanes to grow its operations, adding to an order book that includes the 737 MAX and 787 Dreamliner," said Boeing Commercial Airplanes President & CEO Kevin McAllister. "The 777 Freighter has no competitor in its class when it comes to low operating costs, long range, and capacity to carry cargo."